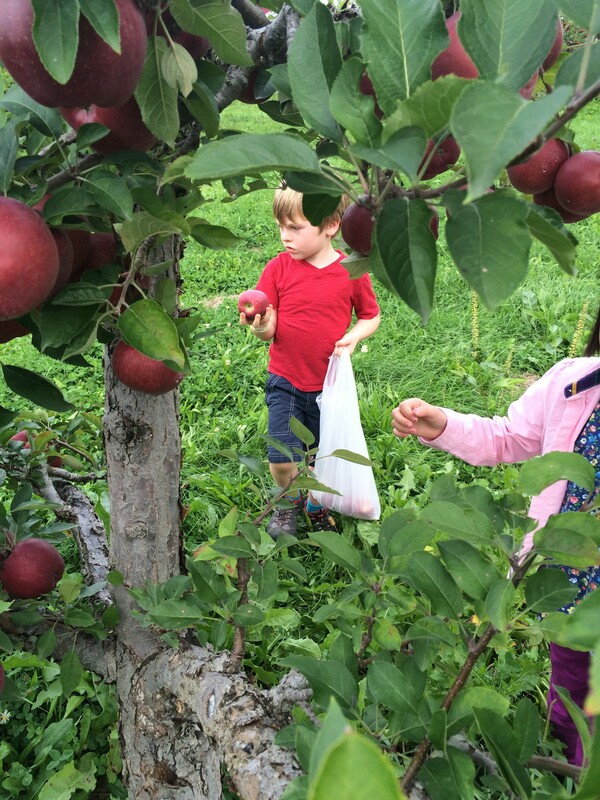 It is the time of the year to study apples! 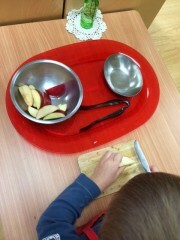 We began the week with small groups demonstrating an apple dissection. 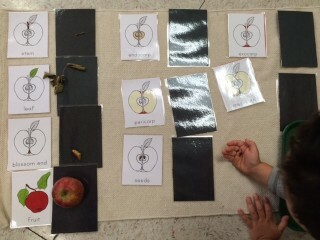 The children hear the names of the different parts of the apple and place the real piece on the black card. Once they have had a lesson, they may take this work out and match the parts whenever they choose. 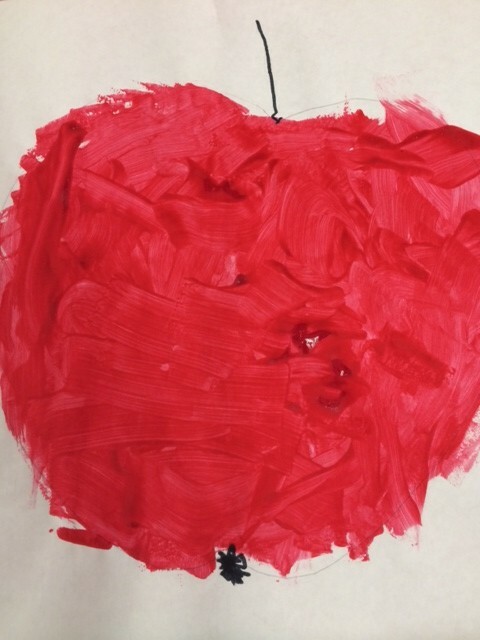 This three year old decided to paint an apple on the art table. 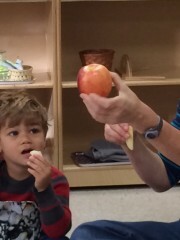 In the first photo he had remembered the leaf on the apple that he saw. Later, when he returned back to do it again, he drew the “blossom end” as seen on the bottom in the second photo. 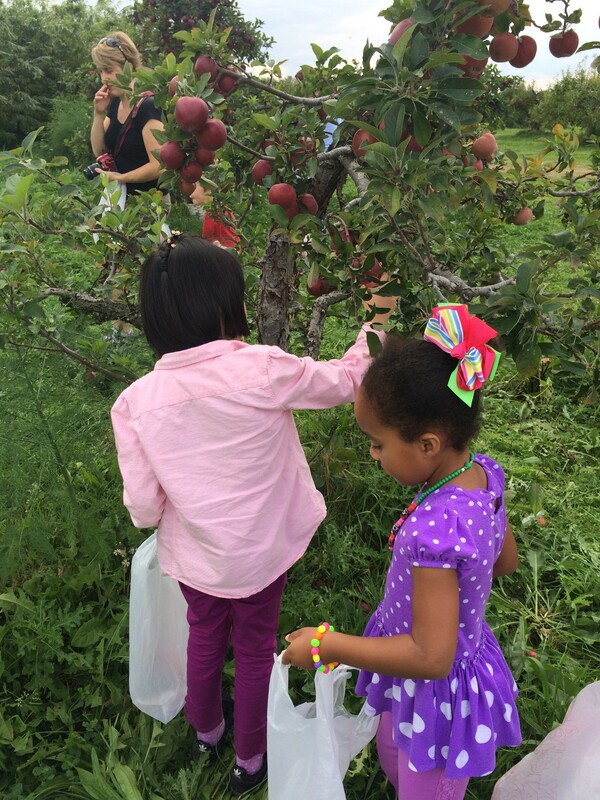 Here they learned about a few varieties of apples, took a tour through the apple washing and storing process, had a snack of cider and donuts and then picked their own apples. This is a wonderful way to get the children to experience how food grows and where it comes from. 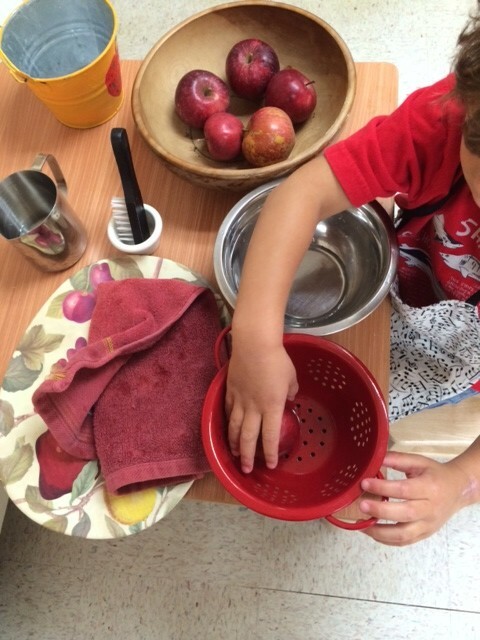 We then made a fun activity of washing the apples. 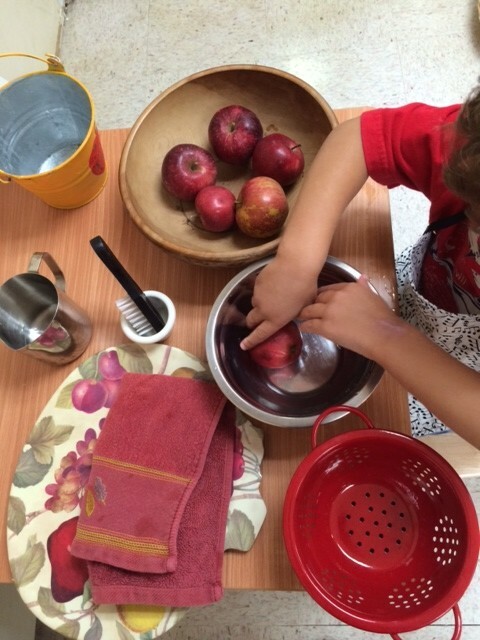 Many children watched the multistep lesson on how to wash an apple and wanted to try it for themselves! After you put on an apron (and have someone tie it in the back), you place out all of the items and fill up the water pitcher. 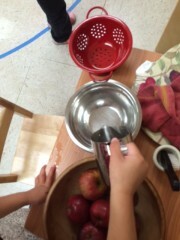 Pour the water into the washing bowl. 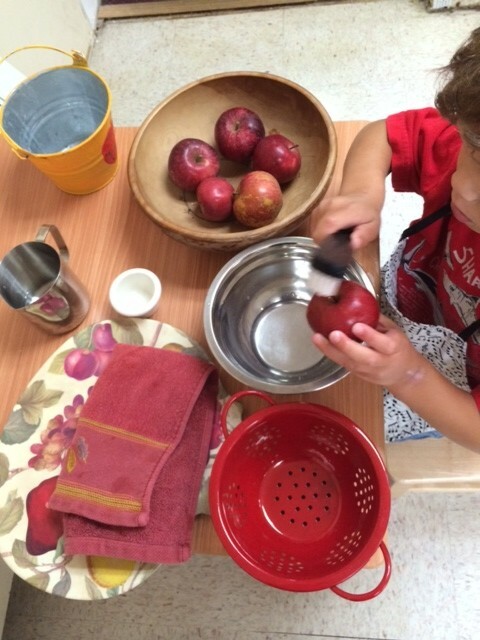 Place an apple in the bowl. 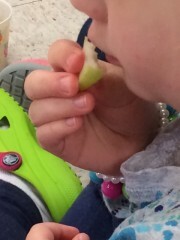 After this the child walks through the classroom with a clean and sparkly apple and places it in a bowl. Most children are very attracted to this activity and want to repeat it over and over. 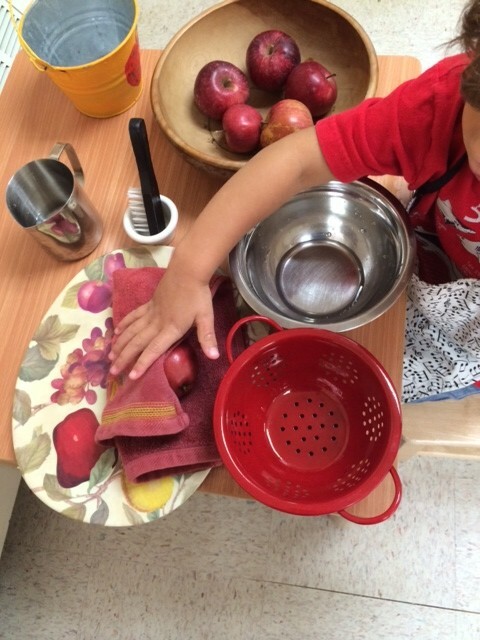 We will use these clean apples to cut and make into applesauce next week. Another art work was apple printing. 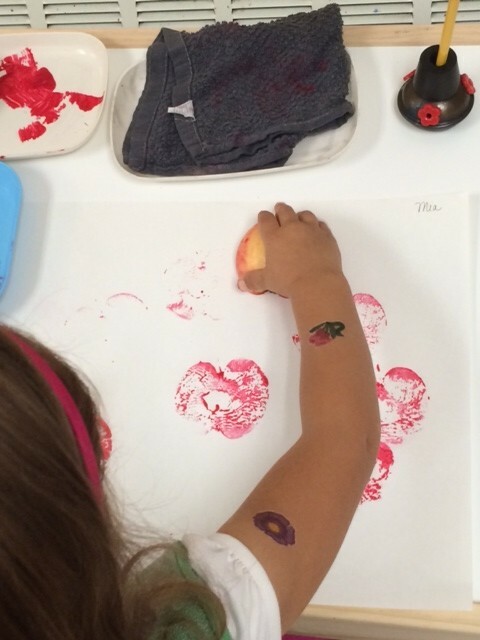 Here the child paints on side of an apple and pushes it on the paper to create prints of apples. At the end of the week, we had an apple tasting. Dr. Montessori stressed the importance of sensorial education at this age. Here, we educate the sense of taste. 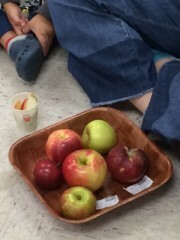 Tasting them and deciding the favorite was the best part for many! 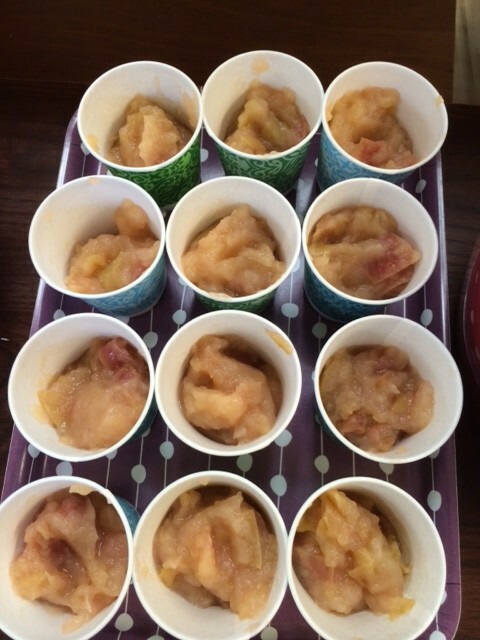 We look forward to our applesauce next week! Learning the decimal system (unit, ten, hundred and thousand) by playing the “Bring Me” game. In this game the teacher asks the child (based on their abilities) to “bring me” a specific number using the golden beads. 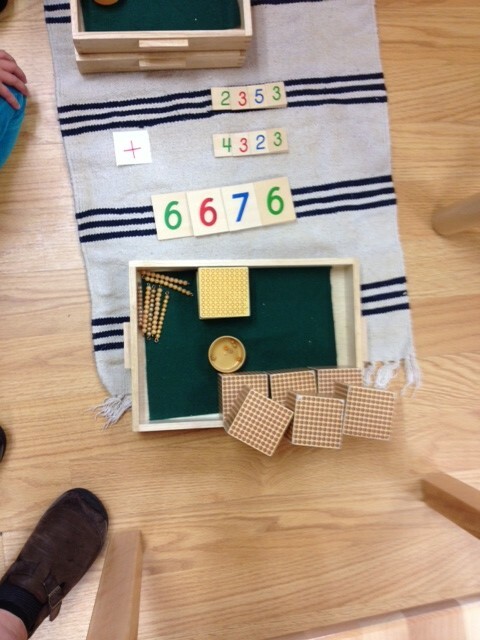 Depending on the student, this may sound like: “bring me five units,” or “bring me forty two,” or “bring me three hundreds, seven tens and six units.” The children carry their trays over to the shelf (the “bank”) and collect the corresponding number of beads then returns to the teacher. They are often seen helping each other. 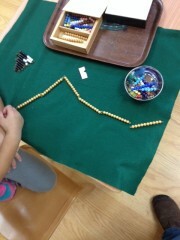 The teacher will then count the beads out loud to reinforce the amount that the child brought back. This can also be played when the child is ready for “Bring Me” with the symbol or numbers. Once the children have worked on learning the values of the golden beads and understand the symbol, they are able to work on addition as a group game. This child works with the “Snake Game.” Here she learns base ten with the golden beads. She is understanding the ten addition tables. 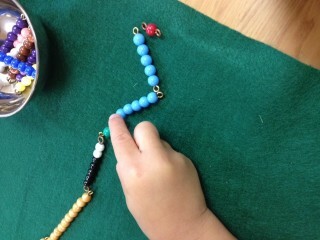 She starts counting the beads and stops at ten. She then removes what she can, marks where she left off and replaces these beads with a ten bar creating a long, golden snake. 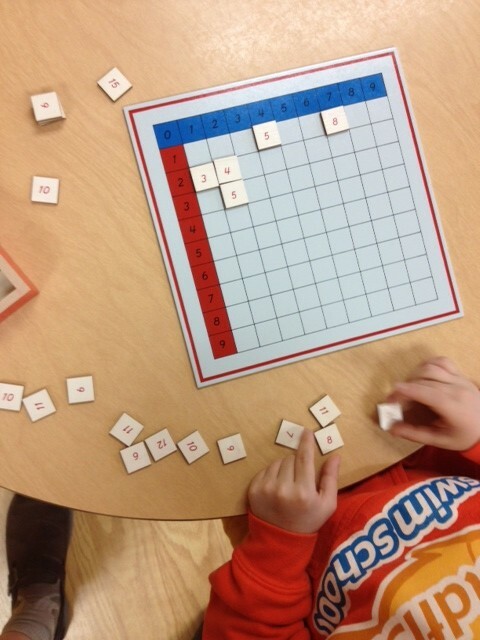 This Kindergartner practices abstracting addition with the “Addition Blind Chart.” He uses folded slips that contain written addition combinations and can find the answer by running his finger down from the top and over from the left side. Where they meet is the sum. Sometimes this can create a product if the child chooses to write down the equations. 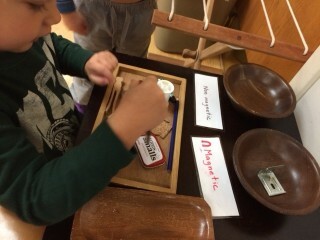 Here is a child engaging in our magnetic/non-magnetic work this week. This magnet work pulls or pushes this tiny car. 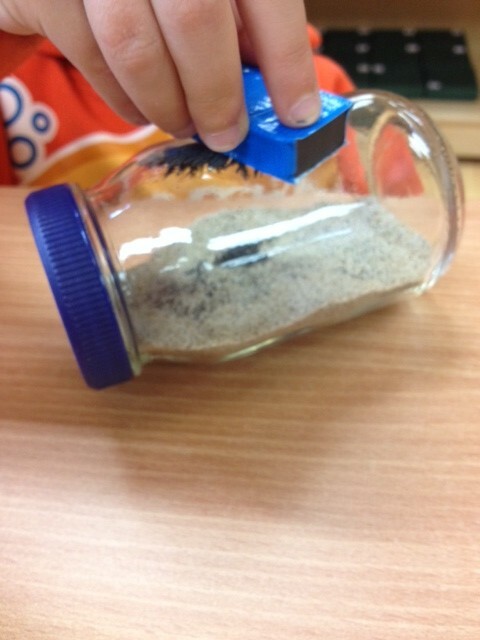 This magnet work uses iron filings and sand. Learning to tie using the bow frame. Cutting the washed apples from last week. This child has gone through a process of getting out the work, putting on an apron, washing hands and returning. 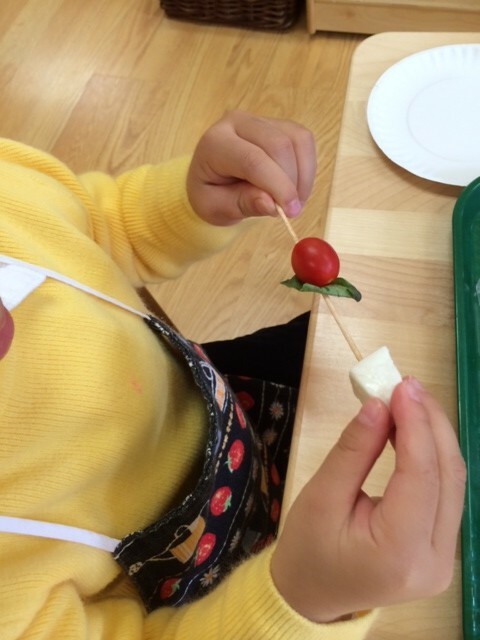 He is engaged in our food prep work of making a caprese salad on a toothpick. 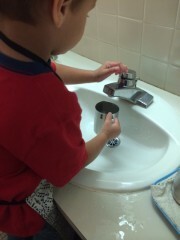 He has just turned three and can do these things by himself now. He then gets to eat the yummy treat. This child uses a sensorial work, Color Box 3, to enhance her visual skills by grading from light to dark in a single shade. This is only a very small sample of what happens every day at AACH. There is so much happening and most of it does not result in a product to send home in a backpack at the end of the week. 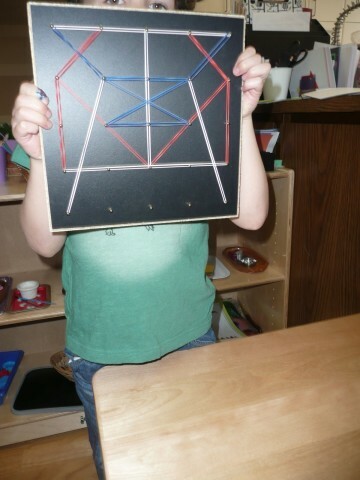 Some of the older children have worked often with the Geometric Cabinet and like to complete extensions. 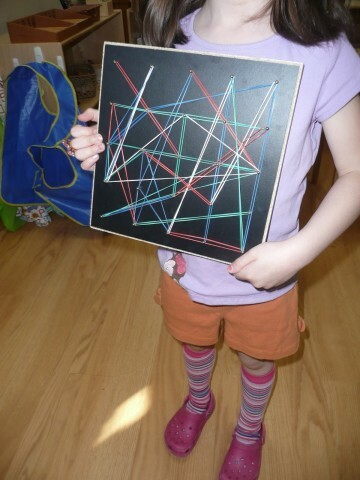 Here a child uses stamps and colored pencils to create a book of geometric shapes. 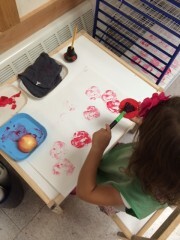 They are familiar with the names and have now started to write everything down. 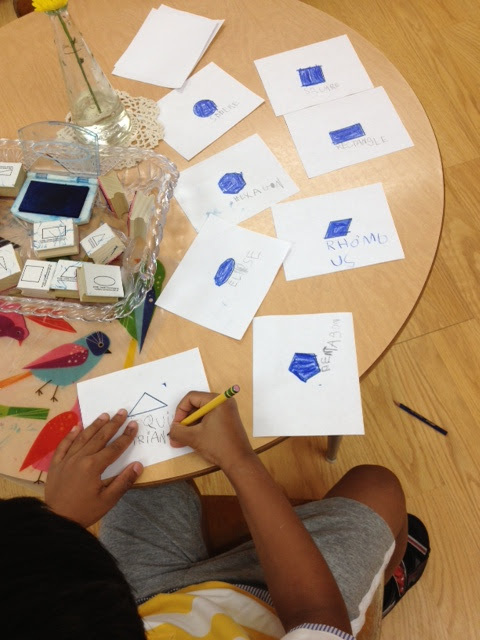 They enjoy making books of their own to take home. We have another addition to the sensorial area of the classroom: the geo board. This board allows children to experiment with geometric shapes and various patterns. 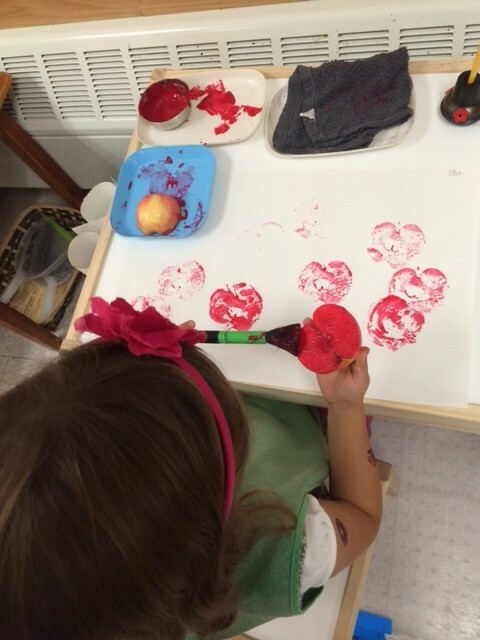 It also helps with fine motor skills! This has been a big hit this week. It was amazing to see all of the various patterns the children are making! 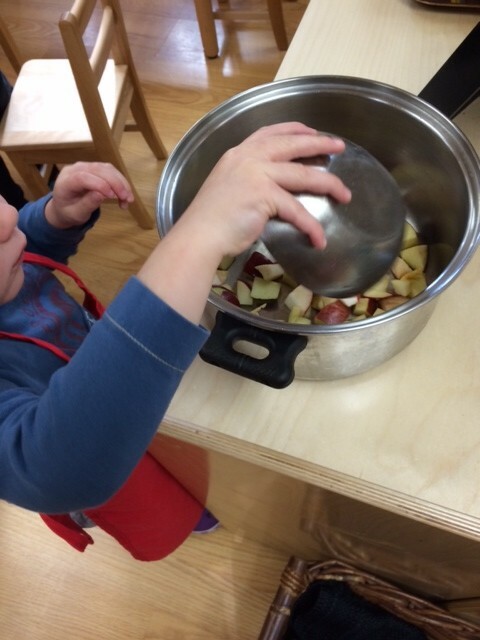 To draw back some of the older children to our sensorial work, we offer extensions. 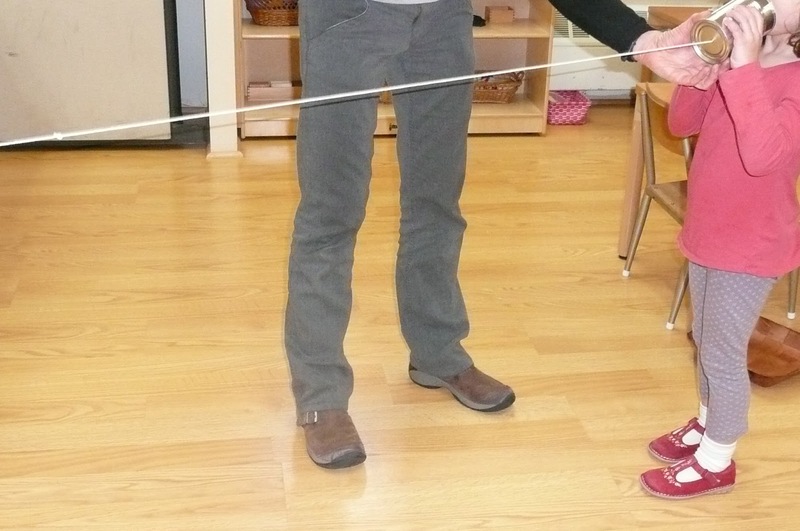 We gave a lesson with the same material but added the use of a blindfold! 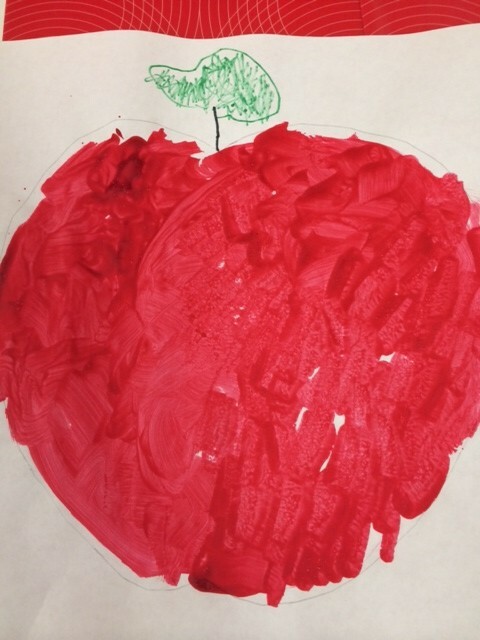 This child now increased her sense of touch and by completing this work without the sense of sight and allowed her hands to do all of the work! 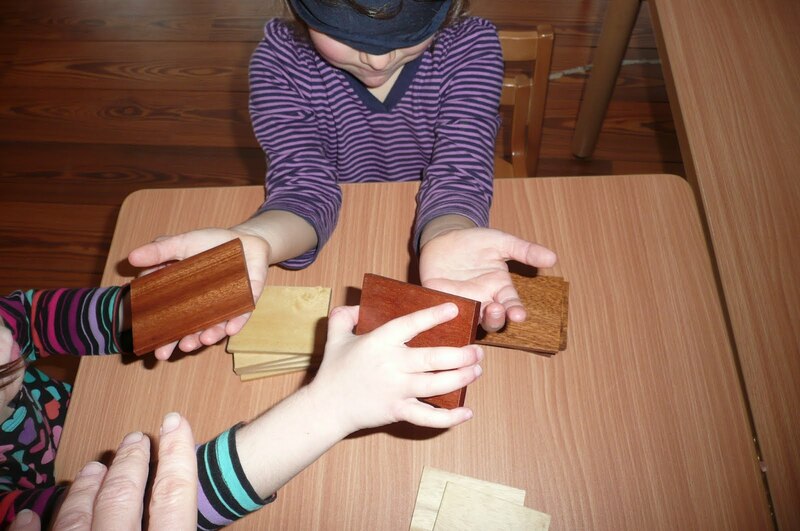 Most children will do the cylinder block work using only their dominant hand. They pick up the cylinders and along with using the visual sense, replace them in the proper areas. When this child decided to complete this work, she first began by using only her right hand. After a bit we suggested using both hands together to help each other out. 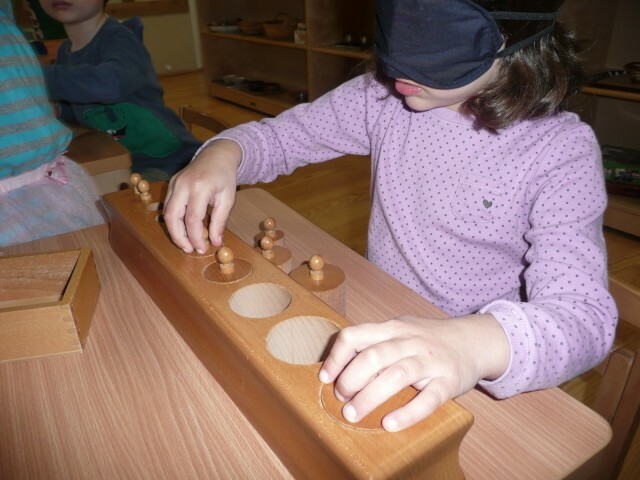 It was fascinating to watch and many children waited for the blindfold to be put back on the shelf so they could take their turn! 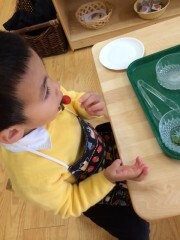 The afternoon children studied sound. We decided to experiment with how sound travels through a string. We rigged up the old tin can experiment. This worked pretty well but then each child made one to take home. 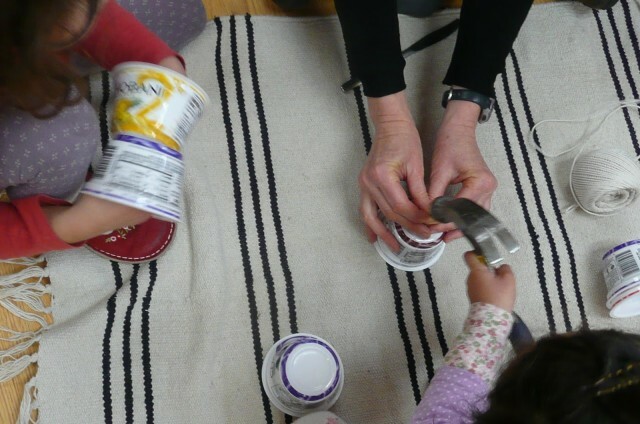 The children used yogurt containers and with supervision, put small holes in the tops. 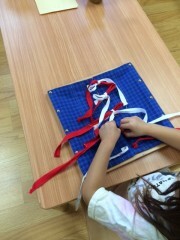 We then added string and made each child a set. These actually worked much better than the tin can set. It fit well over the ear and when pulled tight, you could hear what the other person was saying! 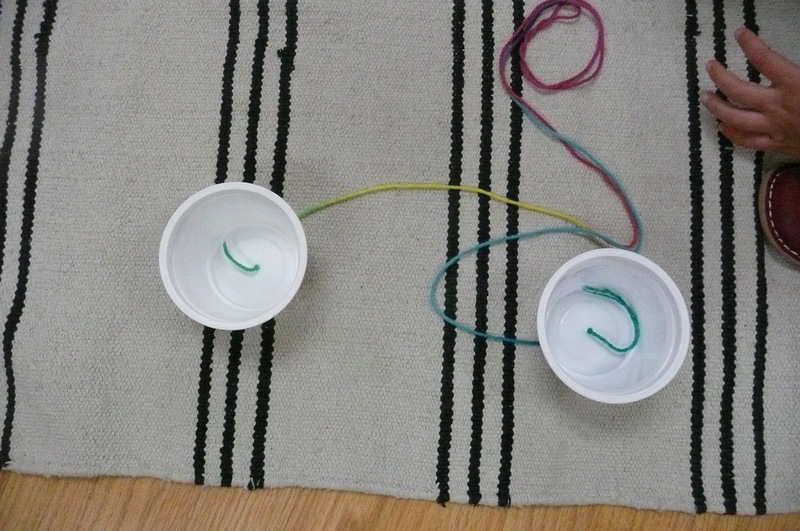 We learned if the string was not “taut” the sound would not travel well. Also, if your hand is touching the string, the sound does not get to the other side. This week we introduced two more geometric solids. The children can work with these anytime they wish but we introduce a few at a time to help remember the names. 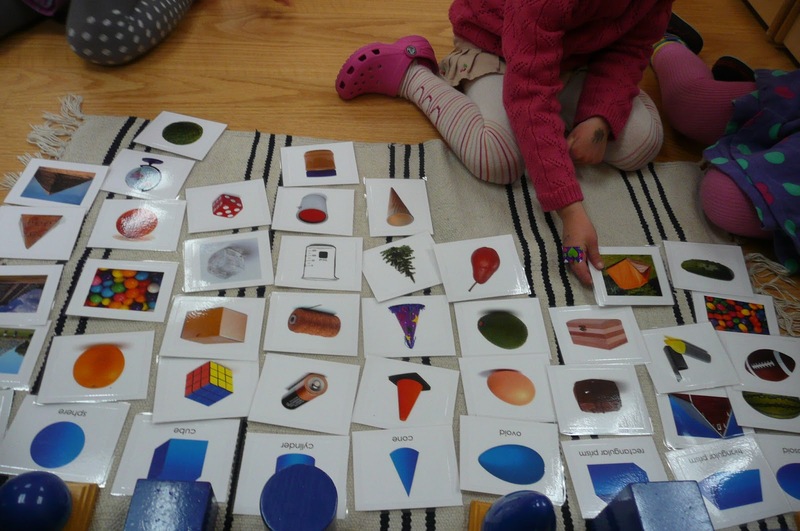 Last week we learned: cone, cube and cylinder. Most of the children remembered the names. This week we introduced sphere and pyramid. 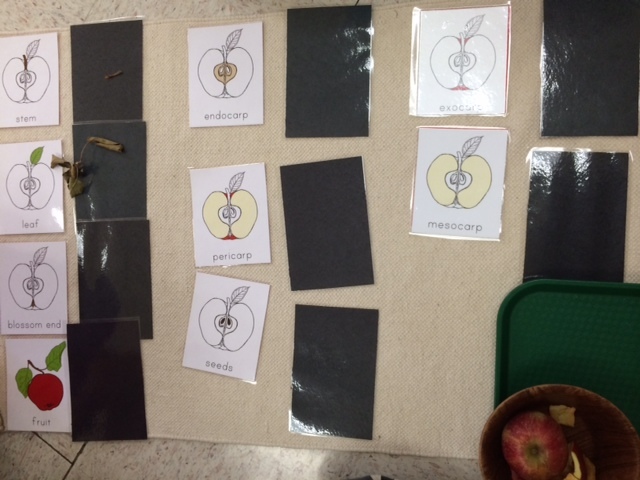 After given a lesson on the vocabulary, we have the children pick a solid and try to find on in our environment. We were successful in finding a match for each one except that pyramid! 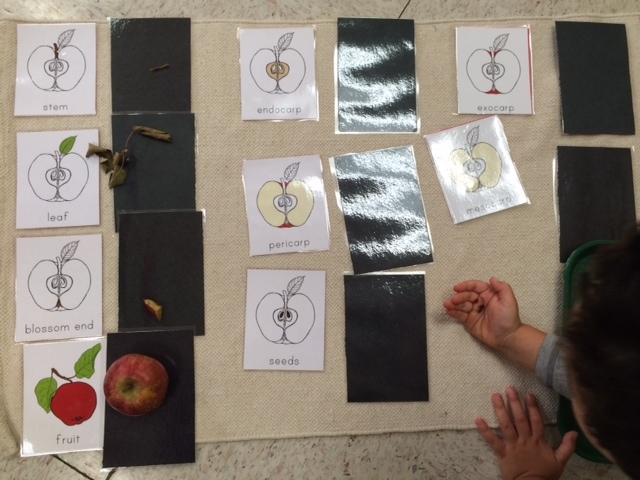 To take this concept a little further, the children can play a matching game with cards. Here they place cards into columns matching the solid. This gave us a chance to learn more about real pyramids! 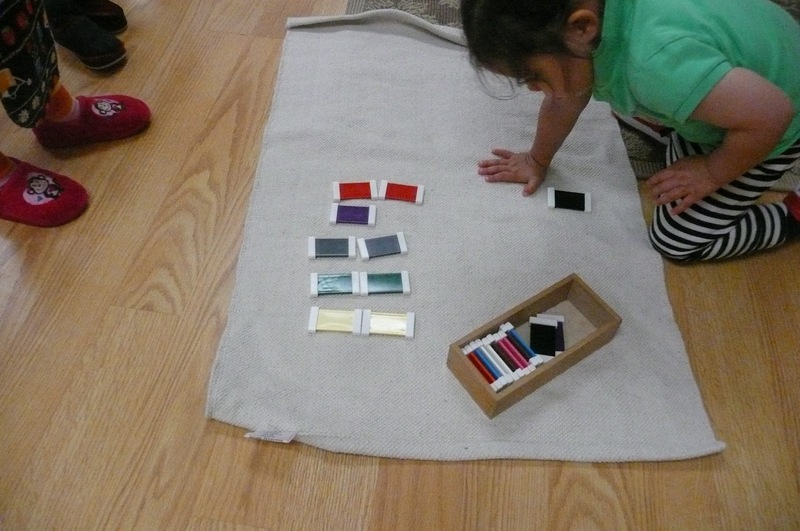 Color Box 2 is a sensorial work with the main objective of developing the child’s visual perception of color. 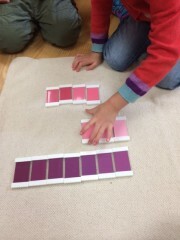 This exercise helps the child learn to match the color tablets and also helps to teach all of the names of colors (11 different matches). After the child works with these tiles, they can move on to Color Box 3 which consists of grading seven shades of nine different colors. The Baric Tablets were developed by Dr. Montessori as a way to develop the sense of touch and more specifically to make fine discrimination in weight. 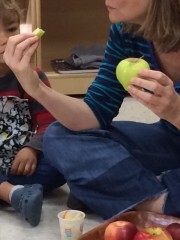 The child wears a blindfold to focus his attention on the weight rather than the color of the tablets. Although there are three different weights of tablets, the two most contrasting ones are used to begin. We teach specific vocabulary such as “heavy” and “light” to describe the different weights and carefully place them on the fingertips of the hand. 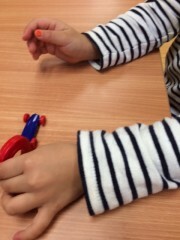 Here a child has completed this exercise and another child wishes to help place the tablets in the hand. After the child feels the difference (by gently moving the tablets up and down), they state which one is heavy and which one is light. We then place these in two separate piles. 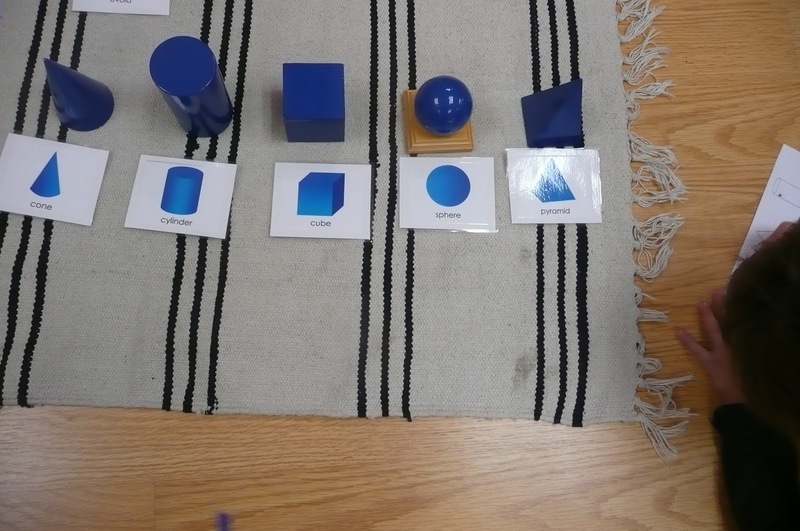 At the end, the child removes their blindfold and looks to see if the piles all have the same color. This is the control of error. At that point they may wish to complete the work again. Montessori (Discovery of the Child, 1988, pg. 118) explains the material is made of wood because, “differences of temperature have to be avoided (and this is why materials are made of wood), if one is to obtain a true impression of an object’s weight. Moving the hand up and down changes the weight because of the resistance of the atmosphere.” As you can see, the Montessori materials are well thought out to provide a rich experience for the children. 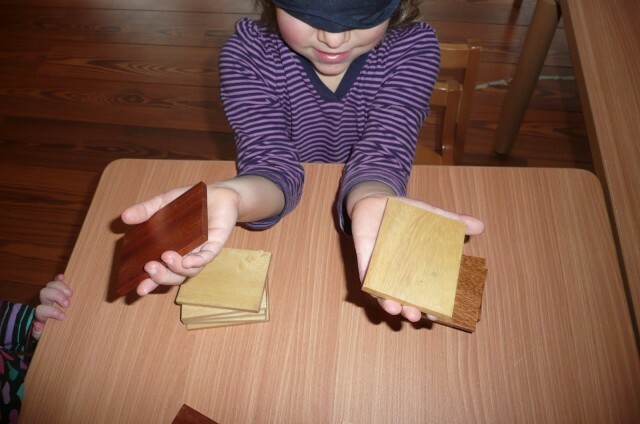 We also present variations and extensions to the exercises Dr. Montessori developed. This one is called the Music Box game. 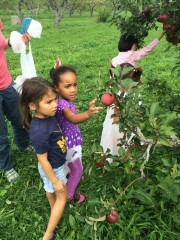 A child sits in the middle of the group with her eyes closed. 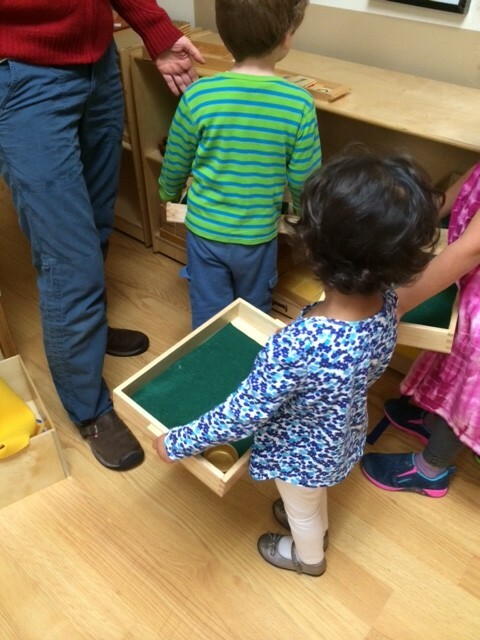 The music box is placed somewhere in the classroom. 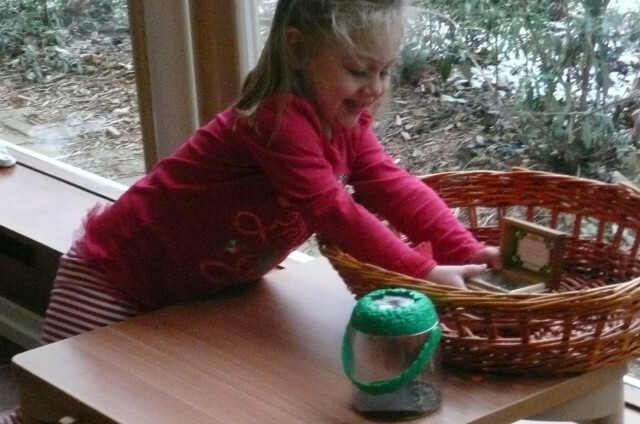 When she is told she may open her eyes, she uses her auditory sense to find the music box. After she locates the box, she then closes the lid gently to stop the music from playing and brings it back. The children love this exercise. 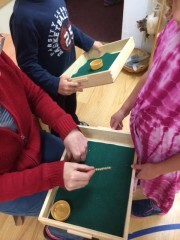 If you have a music box at home, this is an easy game to play. To make it even more challenging try playing with some background noise such as people talking or even a different kind of music playing.